Welcome to the Amazing Experience of WaveReading! Wave Reading™ is a patented method for speed reading that utilizes a twistable pointer called a “wave tool” to wave beneath text lines. The purpose of the wave tool is to induce your eyes to move in a faster and smoother manner to read successive lines of text faster by following the tip of a twistable, shuttling pointer. 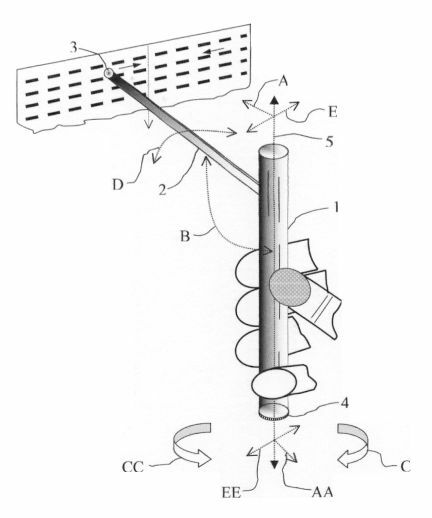 An example of a wave tool in use is shown in the diagram to the right. The twistable pointer is alternately used either for a continuous motion induction reading method or for a widened-glance reading method. The twistable reading pointer can either be used as a training means or as a continuous use device for faster and more accurate reading. The device is simple to understand and to use, and immediately succeeds in increasing your reading speed! You can easily make a free wave tool for your own personal use by simply inserting one end of a 4 to 5 inch (10.16-12.7 cm) coffee or drink stirrer, or a cut straw through the compression clip of an ordinary ballpoint pen to serve as a pointer. Then angle the pointer slightly upward as shown in the photos. The compression of the clip will maintain the pointer angle. When the lower portion of the pen barrel is then twisted back and forth between your thumb and fingers, the upwardly angled pointer tip will move through a quarter-circle and can be easily used to underscore text lines. The moving (or shuttling) pointer tip then guides your eyes at a rapid pace with minimal effort. Examples of various types of easily made wave tools are shown in the photo to the right. The primary advantages to using the wave tool to read are that the tool smoothes out eye movement and makes it more comfortable to read quickly. The wave tool pointer easily induces your eyes to increase the rate at which they move across a page and allows you to quickly alter your speed reading rhythms and to pause and go with minimal effort. The wave tool also provides an effortless physical counterpart to your mental activity to keep your motor system happy while your mind races on through the reading process. With patience in the practice, you will soon understand how amazing Wave Reading can be! In the same sense that any simple hand tool can be used by an adept carpenter in a variety of ways to serve in a number of different contexts, a wave tool can be used in a variety of ways to serve different reading purposes. We may have to read under a variety of circumstances. The position of the material may be angled, flat on a surface, to a side, and so on. The viewing position of the reader may be awkward, or higher or lower than the material being read, and so on. The overall sizing of a book, newspaper, monitor screen, or the font, layout, and so on may present unique reading challenges. Each of these contextual reading issues can be effectively dealt with using a wave tool. And with time, and trial and error methods, you can learn when it is best to use the wave tool upright, inverted or horizontally, and determine as well when one pointer angle is preferable over another. But if you wish to save time and get on with improving your reading speed using your wave tool, you may download a FREE PDF copy of the Instruction Manual using the link below. By using the Wave Reading™ Instruction Manual as your guide to faster and better reading, you will quickly learn how to use your wave tool under all reading circumstances, and as well learn numerous tips on increasing your reading speed and comprehension skills. Your Free Wave Reading™ Instruction Manual may be copied and distributed at will so long as it is not used in any way to financially profit in violation of the copyright. The Future of Wave Reading! Your wave tool has its problems. It has to be disassembled and reassembled each time you wish to use it. Carrying the pointer with you, even if rubber banded to your pen, is awkward and inconvenient. 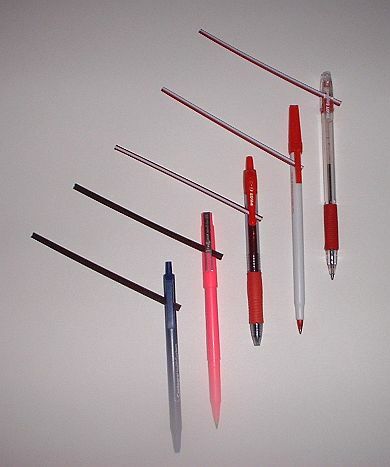 It is our hope that we will soon be able to manufacture inexpensive ReadWrite wave tools associated with writing instruments, and as well to offer an inexpensive plastic, hinged-pointer, clip-on wave tool to fit an average sized pen barrel. 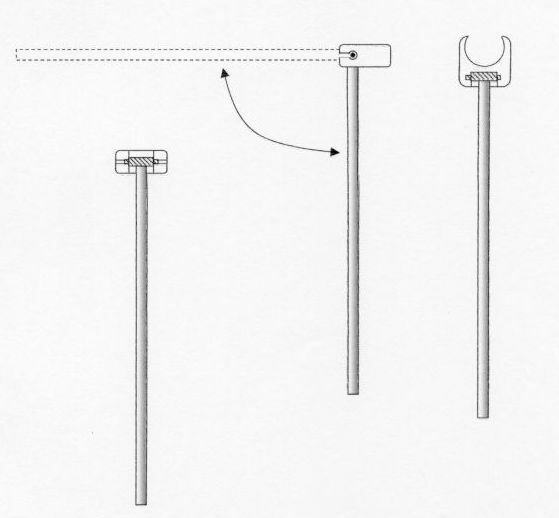 A clip-on pointer for a pen (such as is shown in the photo to the right) would have a fold-down pointer that would rest parallel to the pen barrel and allow you to easily carry the tool with you in your pocket. Hopefully such ReadWrite tools will be the Wave of the future! As you learn to use the wave tool and improve your reading skills, you will be both witnessing and being a part of a reading revolution in the making. As you refer Wave Reading™ to your friends and your local media, you will be helping to change and improve the way everyone reads! 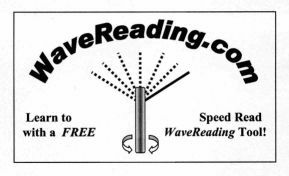 WaveReading Manual, please CLICK HERE! "Thanks so much for letting me download The Wave Reading Instruction Manual. from your manual than months of looking at books and websites on speed reading."